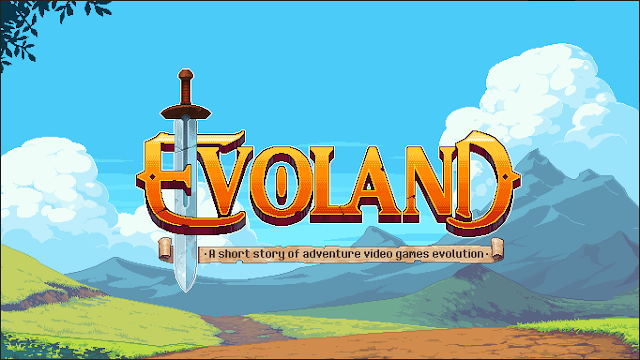 About a week ago, I heard about this game by the name of Evoland, a really interesting little game spawned from a LudumDare creation. As a game that is both inspired by and a tribute to the like of The Legend of Zelda and Final Fantasy, I was instantly intrigued. It struck me as a very whimsical game that would be just up my alley, and so I picked it up as soon as it came out. I've now played the game to completion, and normally I wouldn't bother making a post about such a small game, but it was interesting enough that I think it's worth talking about. So I already mentioned that Evoland is a sort of tribute to oldschool games, but in truth that's not entirely accurate. 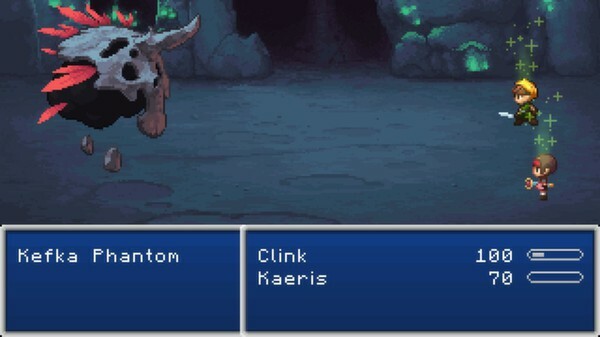 While the game is chockfull of references and clearly takes a lot of inspiration from old RPGs, it's more of a tribute to the evolution of games than any particular title or genre. True to it's name, Evoland's biggest claim to fame is the fact that it literally evolves as you progress. Think Upgrade Complete or DLC Quest, but finding your upgrades rather than buying them. When the game starts you are a simple 8-bit character with a Gameboy style black and green color palette. You can't even move left, but as you explore you uncover better colors, sound effects, higher resolutions, menus, and even 3D. As far as the gameplay itself, it begins as a typical top-down adventure style game a la Zelda, but you soon unlock turn based battles as well. One of the things I was most skeptical about going into this game was the fact that it features both this Zelda style adventure mode and the Final Fantasy style Turn Based mode. Now I'm going to be kind of blunt. Evoland isn't a particularly good game. Gameplay wise, it's pretty mediocre and unsurprisingly suffers a lot from a lack of focus. As nifty as all the references are, it suffers a lot from trying to do too many things, and subsequently having most of them end up disappointing. What's more, I found that there was a very palpable dissonance between the game modes. It felt very strange to get through an adventure mode dungeon with only half a heart remaining, only to have full health upon getting into a random battle on the world map. What's more, the tools you can use in adventure mode have no bearing on turn based combat. Similarly, all the equipment and experience you gather for the turn based combat does nothing for adventure mode. It's especially noticeable because because the game is a mere 3-4 hours short, and so you never experience either mode for more than a couple areas. Stuff like your experience level just doesn't end up mattering at all. 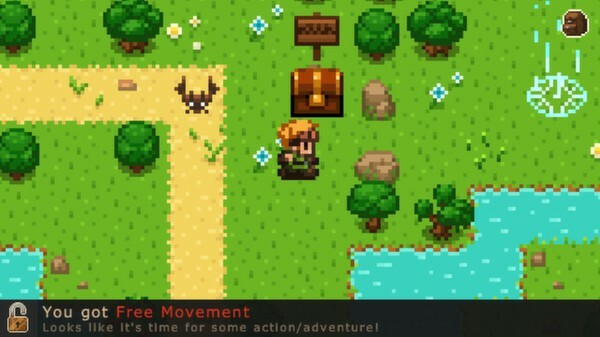 Evoland's turn based combat is ultimately pretty bad. While pretty much every enemy is amusing, the battles are just boring and very shallow. There isn't a battle you can't win by having one character attack every turn and the other heal. It's not even a targeted heal, it just heals both characters. However on the flip side of things, the Zelda mode is actually pretty good. While it's combat isn't that great either, it's got some surprisingly clever puzzles. For example, early on you encounter an impassable block called a "Dimensional Tile". Later on when you return to the area in 3D mode, you realize it was just slightly raised, and 3D you can step right over it. This kind of thing becomes especially important when later areas actually contain crystals you can strike which will switch between 3D and 2D mode. This is unquestionably when the game is at it's best. Being able to experience a couple of areas in both 3D and 2D is pretty cool, and using that as a game mechanic is genius. Mechanically it's not that different than something like the crystal switches you might see in the Zelda series, but aesthetically it has a totally different feel to it. Unfortunately though, Evoland is a game with nothing to offer but novelty. It's charm and uniqueness is such that the first couple hours are pretty easy to get through without even noticing the gameplay flaws. After the first hour and a half or so though, new things stop showing up and the game goes down hill pretty rapidly. Playing the game for gameplay's sake just isn't entertaining. The game becomes a bit of a chore to get through, and I found myself caring a lot less about completeness. Granted, "completeness" doesn't really seem to be rewarded particularly well. In the early game chests were exciting, as they usually meant some new feature being unlocked. By the end chests are just annoying. You go out of your way to get them, and are literally rewarded with a gold star. What function do they fill? As far as I can tell they are nothing more than a collectible to get because why not. Some chests contain playing cares, which can be used to play Double Twin, a clone of Final Fantasy VIII's fantastic Triple Triad mini game. Even that manages to be a poor imitation of the source material, though. Which is ultimately what Evoland comes down to. It's an extremely unique game, it's overflowing with charm and fun references to games I love. Despite these things, it's a game that still struggles to be competent in it's own right. It deserves a lot of praise for doing such interesting things, I can't even begin to fathom how they did this (in Flash, no less). The experience of actually playing the game is just quite lacking, even down to frame rate issues, glaring bugs and lack of native controller support. I greatly enjoyed the references, and I think with more time the game could have been great even despite the splitting it's focus. As it stands though, I tend to think 2 hours of novelty and 2 hours of mediocrity is perhaps not worth the $10 price stamp. I'm glad it exists though.